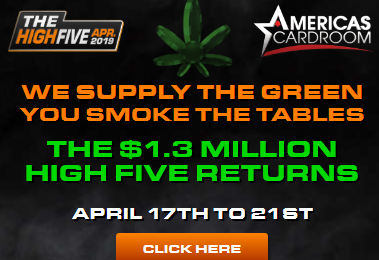 Win Billion Dollars on DraftKings TV Ad? Alright, you’ve probably seen the New DraftKings ads while watching football like I did on TV. How much does it cost? 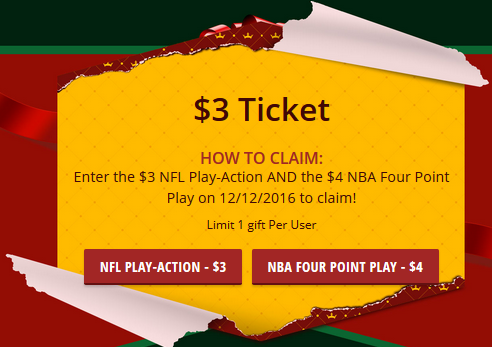 It’s completely Free to enter, you just have to have a DraftKings player account. Now, I’ve seen the numbers blasted all over the web on anyone’s individual chance of winning it and most of the experts compare it to being twice as hard as hitting the Power Ball numbers with a 1 ticket, quick pick. It is almost a certainty you won’t get the perfect line up, but there is always that chance, that fluke line-up, that bizarre play that ends up putting you on top. Why should I bother? Because this Free Billion Dollar Contest also includes a $100,000 NFL Week One Free Play on DraftKings. Here are the details of the $100K free play. 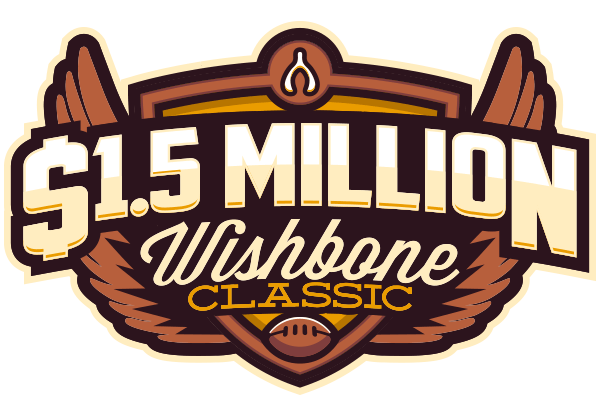 You have a better chance of winning something on the $100K Free Play, in fact over 138,000 players will win something on the Free Play Contest. 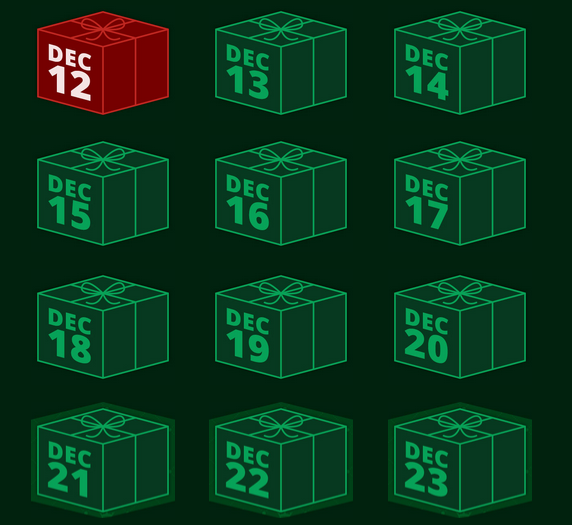 Back to the Billion Dollar Lineup contest, How can you win it? The difference between a winning line up and the perfect line up is simple. A winning line up scores more fantasy points than most other competitors line ups in that individual contest. A perfect line up has the highest scoring player at each individual position staying within the salary cap constraints of that contest. Who determines this Perfect Line up? DraftKings will run every possible combination of players, positions and salaries after every Week One NFL game is complete and then post that one perfect line up that stays within the salary cap and scores the most points possible on the DraftKings PlayBook on their site. This is something they have been doing for a few years and it is extremely interesting to see that winning combination each week. Look at the image, note the $3500 and less salaries. A typical weekly winning contest line up might score 200 fantasy points. A typical weekly perfect line up might score 287. The winning contest line up usually uses most of his salary cap on top rated/expensive players for his QB, RB’s and WR’s. He went cheap on his TE, Flex, K and DEF. This showed on his line up scoring, lots of points at the top and fewer at the bottom. The perfect line up used a mix of high price players for the big scores and a few bargain(low price players) that just happened to over achieve and happened to score a lot of points this one week. The key here is the player price, find those low salary “diamonds in the rough” this week who can out perform the big name players. You obviously follow football, use you research to take advantage of what you know. Use hidden up and comers. If your favorite NFL team has a low priced rookie RB or WR with a chance to be on the field a lot this week start him. NFL Coaches like to keep secrets, chances are you have heard of or seen players in your home town that the rest of the country hasn’t. It’s very likely that a unknown rookie in Chicago will not be on a New York fans radar this week, but he is on yours. Use the internet, look at each NFL teams home page. There is plenty of info out there to find names of unknown guys who just may be the in the lime light this week. Injuries are another way to build a Billion Dollar Line up, look for injuries that make back-ups play a lot. The depth charts are always a place to find names to replace injured star players. That’s just a few suggestions, always remember to include the big names around your sleepers, a few minimum priced players make using David Johnson, Antonio Brown and Aaron Rodgers a lot easier to afford each week. Of course don’t expect to win that Billion Dollars, no one probably will. 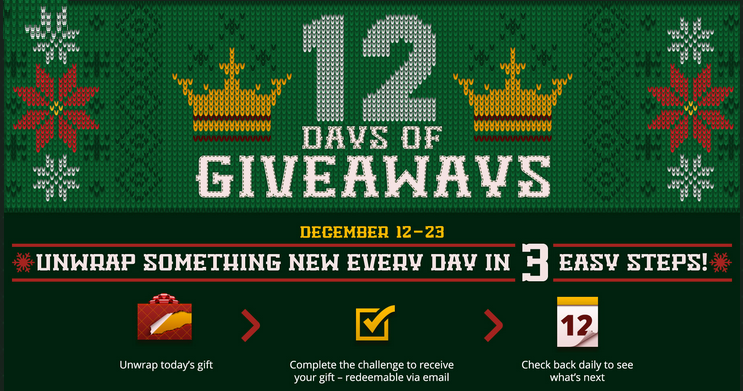 DraftKings just may have this promotion a few more times this season (no confirmation on that). Join DraftKings Now and get a instant 25% Deposit Bonus added to your account in DK Dollars and play in the Week One Billion Dollar Lineup/$100K Free Play for week one of the 2017 NFL Season. •Pick a line up of 9 NFL players and stay under the $50,000 salary cap. •Choose players from all the 11 NFL games on Sunday, December 4th (NFL Week 13). •Contest is free to enter and the top 880 finishing lineups get paid. •Visit the DraftKings Playbook for fantasy football tips and strategy. Week 3 DraftKings Line Up Suggestions and Stacking advice. 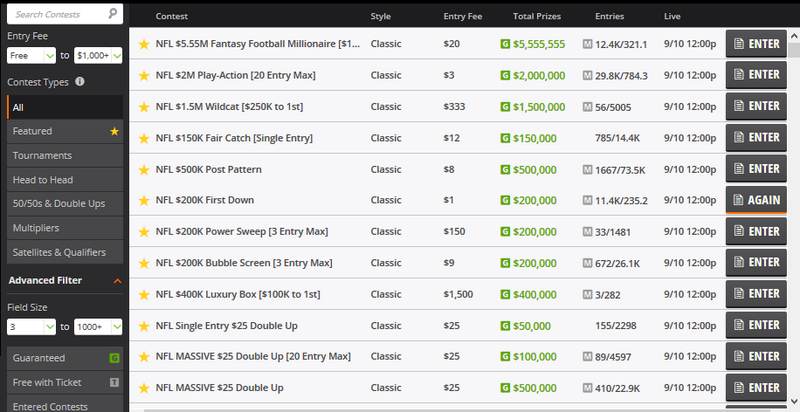 Welcome to Week 3 on DraftKings…. Now that we have a week of NFL fantasy under our belts, we can maybe see a couple of trends developing? We haven’t seen everything, but we can sorta notice (we’re still mostly guessing at this point) how some things are developing. Vegas has set some very low scoring overs for week 3, they seem to think scoring will be low this week with many notable defensive games. In fact there are 8 games projected to have total scoring of 44 points or less. Week 2 saw a lot of anticipated fantasy scoring fail to materialize. Who knew that Saints and Giants could actually play some defense? Who knew the rain/wet conditions in Pittsburgh would affect the aerial attacks of the Steelers and Bengals to the extent it did? Those 2 games alone severely hampered and disappointed many fantasy players. Injuries also dotted the NFL landscape with several notable players going down in week 2. Running back’s took the brunt of the mayhem with A Peterson MIN, A Foster MIA, D Martin TB, A Abdulah DET, J Stewart CAR and D Whitehead SD leading the list. Injured Wide Receivers: D Moncrief IND and D Baldwin SEA. Injured Quarterbacks: J Cutler CHI and J McCown CLE. The Atlanta at New Orleans should be the game fantasy players key in on Monday Night. Make sure you have exposure in this one. Brees, Cooks, Snead, Ryan, Julio and Freeman all should be considered. I’m also liking the Miami offense this week, namely R Tannehill QB, J Landry WR, D Parker WR and J Ajayi RB (monitor A Fosters status) all having a good days against the Cleveland Defense. Start the MIA DEF against the Browns. Matt Forte NYJ RB looks like he is 25 again, ride him again this week. Q Enunwa NYJ WR is also an interesting play, most defenses pay so much attention to B Marshall and E Decker he is often forgotten in coverage. The SD at IND should also have a few nice fantasy plays. Play P Rivers SD QB and stack him with T Benjamin SD WR. A Gates SD TE should see even more targets with D Woodhead RB now on IR. P Dorsett IND WR and D Allen IND TE will also be seeing more targets from A Luck IND QB with D Moncrief IND WR status still unknown at this time. OAK at TEN should also be another battle of porous Defenses, make sure you get D Carr OAK QB, A Cooper OAK WR, L Murray OAK RB, M Mariota TEN QB, D Murray TEN RB, T Sharpe TEN WR and D Walker TEN TE added to your lineups wherever possible. The Sunday night game features CHI at DAL. Chicago looked worse than Cleveland on Monday night. Start the DAL DEF (no J Cutler for CHI and B Hoyer is starting?) and this could be finally be the week that D Prescott and D Bryant finally hook up for a couple of long scores. E Elliott should have a excellent rushing game in the 2nd half with a big lead. D Washington DET RB will be starting in A Abdulahs place. F Whittaker CAR RB will start in J Stewarts place. Play on Week Three for Free on DraftKings, with any deposit. Injury updates: J Charles is expected to play this week in a limited manner. C Ivory JAX RB and T Eifort CIN TE returned to practice this week. Week 2 DraftKings Line Up Suggestions and Stacking advice. 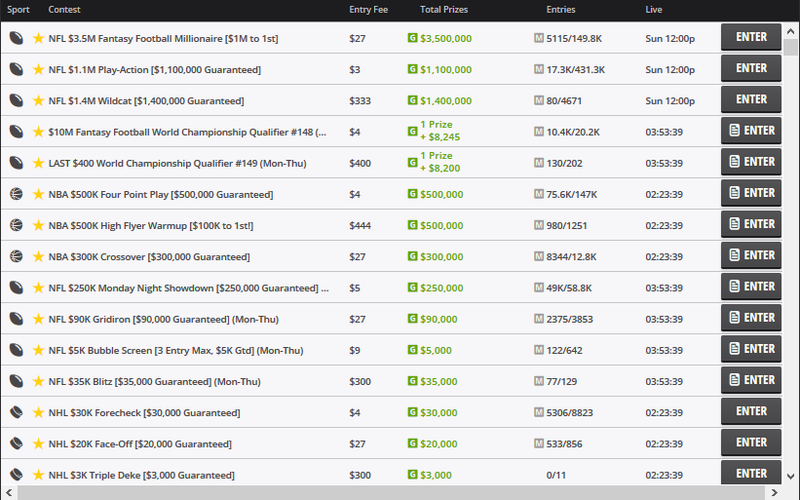 Welcome to Week 2 on DraftKings…. Vegas has set some very high scoring overs for week 2, they seem to think scoring will be up in 2016, so I am looking at some very high scores for us fantasy guys this week. I benefited greatly using D Williams PIT RB and A Brown PIT WR on Monday Night on week one, I’m going to ride the Steelers offensive studs until further notice. AJ Green CIN WR excelled in week one, expect him to see numerous opportunities in a high scoring game with the Steelers this week. Until further notice start whatever defensive team is playing the LA Rams, this week it’s the Seattle Seahawks. SF is at CAR this week, The 49er DEF held the LA Rams to 0 points. The Panthers are not the Rams. I’m looking at C Newton QB, K Benjamin WR, G Olsen TE, T Ginn WR and J Stewart RB all as very playable this week at home. S Ware RB KC had a great week one against the Chargers, He’s up against a better HOU DEF this week and we still don’t know if J Charles will be available. Start Ware, but don’t expect a 30 point game. JAX is visiting SD this week, I’m liking the Jaguars to rebound from their week one loss to GB in a big way. B Bortles JAX QB, A Robinson JAX WR and A Hurns JAX WR should put up bigger numbers against he Chargers DEF this week. K Allen SD WR was put on the IR with a knee after week one, this makes T Benjamin SD WR, T Williams SD WR and A Gates SD TE more viable targets for P Rivers SD QB to throw to. Arizona lost to NE on Sunday night, look for the Cardinals to take out some revenge against TB this week. Make sure you get D Johnson ARI RB, L Fitzgerald ARI WR and M Floyd ARI WR in your line ups, I can see J Winston TB QB throwing an awful lot to play catch up with M Evans TB WR being the big target for Winston. T Sharpe TEN WR didn’t disappoint in week one, look for him to continue to prosper this week against DET. D Prescott DAL QB had an okay ( 10.3 fp’s) first start for the Cowboys, his price increased to 5800 on week 2, which is still a great value for the starting QB on a good offensive team in what should be a high scoring game against Washington. 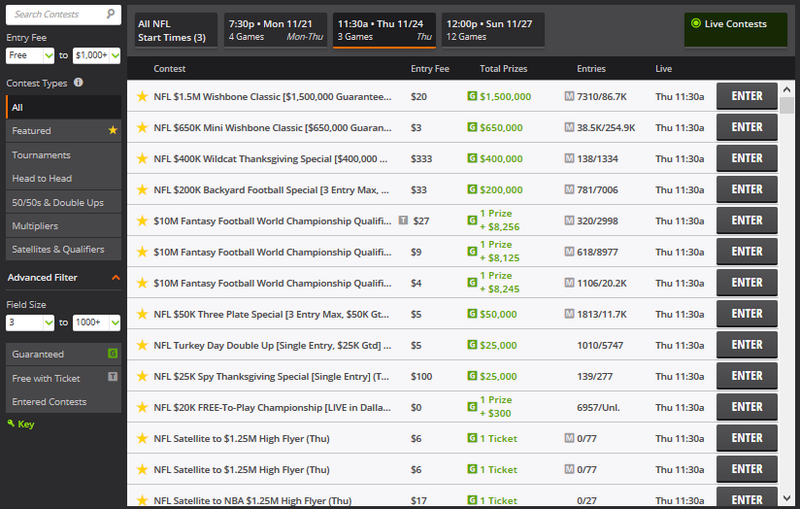 Play on Week Two for Free on DraftKings, join the $100K Free Contest Today…. Here are the Always Rules that I use to help me in my line up decision making process.